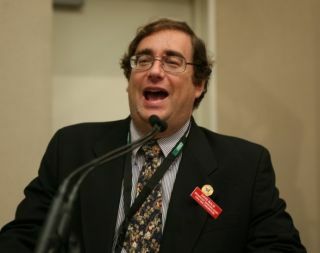 New York, NY--131st AES Convention Chair Jim Anderson reports that Broadcast & Streaming Sessions Chair David Bialik has developed a wide-ranging program of events for the convention. Broadcast & Streaming Sessions Chair David Bialik. “Significant technical and sociological changes which impacted the broadcast industry over the past decade have affected every corner of the pro audio industry,” Anderson said. “In his 25th turn as Broadcast/Streaming Chair, David Bialik continues to deliver ‘destination’ sessions of real consequence to our attendees. IMPROVING THE STREAMING AUDIENCE EXPERIENCE: Moderator – Bill Sacks, Dolby Labs. Panel: Rusty Hodge, SomaFM; Michael Daskalopoulos, Dolby; Markell Lanbright, CBS Radio; Greg Ogonowski, Orban: Today’s hyper competitive digital media environment presents listener/viewers with countless options. Audiences are increasingly aware of high quality audio and seamless players. Compromised audio streaming will loose these fickle users forever. Options for improving the audience experience will be explored. STREAMING & ENCODING: Moderator - David Bialik, Panel: Jeff Reidmiller/Steve Lyman, Dolby Labs; Todd Baker, SRS; Jan Nordmann, Fraunhoffer USA; Greg Ogonowski, Orban’ TBA: No issue affects the broadcast/streaming industry and audience more intimately than the multitude of methods available for streaming and encoding media. Various options, and the need for a universal solution will be addressed. WORKING WITH CONTENT DELIVERY NETWORKS: Moderator-Ray Archie, CBS; Panel TBA: Focused on the relationship between distribution and encoding methodologies, this critical panel will address: Licensing, error-correction; quality vs. compression; consumer-adoption; and the future of scalable/reliable digital distribution. A not-to-be-missed event. FACILITY DESIGN – RENOVATION AND RETROFITTING: Moderator - John Storyk, Walters-Storyk Design Group: Panel – Howie Schwartz, HSRNY; + TBA: An abundance of economic, technical and social issues have fueled the growing need for broadcast and post-production facility upgrades and expansions. Driving issues include changing delivery and production protocols (i.e. HDTV, surround audio, etc.) and a volatile financial climate. Typically, facilities expand or improve their audio production rooms by retrofitting an existing studio or installing a new room within a complex. This panel will explore specific design/reconstruction techniques, and provide examples with an emphasis on repurposing acoustics and technology. AUDIO ENGINEERING - SUPPORTING PEOPLE WITH DISABILITIES: Moderator - Eric Small, Modulation Sciences, Panel: Alison Greenwald Neplokh, Chief Engineer, FCC Media Bureau; Joel Snyder, Audio Description Project, American Council of the Blind. Creating both challenges and opportunities for the audio engineering community, the Twenty-First Century Communications and Video Accessibility Act (CVAA- Oct. 2010) increases disabled person access to new digital, broadband, and mobile innovations. This workshop will explore CVAA from the POV of an engineer/regulator who helped write the law and of a creator of content, which implements a key aspect of the law. LISTENER FATIGUE AND RETENTION: Moderator - David Wilson, CEA, Panel: Ellyn Sheffield, Towson U. (MD); Sean Olive, Greg Monti, Citadel Media; Frank Foti, Omnia; Greg Ogonowski, Orban; Thomas Lund, TC Electronics; and Todd Baker, SRS Labs: Listener fatigue remains a vital broadcaster concern and a growing issue with telecommunications service providers, consumer electronics manufacturers and music producers. Fatigued listeners may tune out a specific broadcast, but frustrated cell phone and portable media player users have the option of switching carriers or purchasing different playback units and disparaging the reject. This panel will survey these perennial problems and assess potential solutions. FM STEREO BROADCAST’S 50th ANNIVERSARY: David Bialik and the AES NY Section: Are developing An all-star assembly of on air personalities, and broadcasting exes. will gather at the famed P.C. Richards Theater in TriBeca to discuss the evolution and impact of Stereo Broadcasting and celebrate its 50th anniversary. This 150 seat ‘jewel box,’ venue has hosted ‘private’ performances by artists ranging from Bon Jovi to Mumford and Sons. Tickets are limited. LIP SYNC ISSUE: Moderator - Jon Abrams, Nutmeg Post; Panel: Steve Lyman, Dolby Labs others TBA: Lip sync remains a complex problem, with several causes and few solutions. From production through transmission and reception, there are many points where lip sync can either be properly corrected or further compromised. This panel will discuss such issues as: Where do latency issues exist? How can they be measured? What correction techniques exist for controlled environments? How does video display design affect lip sync? And, who is responsible for implementing mechanisms to ensure lip sync is maintained when the signal reaches the viewer? SOUND EFFECTS FOR THE WITCHES OF LUBLIN: Sue Zizza, Director/ Producer; David Shinn, Master Engineer and SFX artists: Butch D'Ambrosio, Sylvaana Pinto and Mark Wiener collaborated on this ambitious, tightly budgeted, and widely acclaimed Public Radio presentation. This unique panel will recap the complex project in three interlaced segments: a) Recording live effects - how the team created and captured program elements late at night in their home studio. b) Recording a large cast in a single session while maintaining isolation for intercuts and post editing. c) Recording fully isolated live music – in a non-studio environment. AUDIO PROCESSING FOR RADIO: Moderator -Steve Fluker, Cox Radio; Panel: Bob Orban, Orban; Frank Foti, Omnia Audio; TBA: The term “over-processed radio stations” has supporters and detractors. This exploration of audio processing in the radio environment will include a recap of the history of the field, including the advantages of digital processors. Acknowledging radio’s digital/ analog environment, the discussion will include do’s and don’ts for processing radio in the digital realm. The experts will also venture a gaze into the future. CONSIDERATIONS FOR FACILITY DESIGN: Moderator Bice Wilson. Meridian Designs: This panel, TBA will consider a ‘best of all worlds’ theoretical facility design project. What would the architects, contractors, systems integrators and clients like to see in their ‘money, time, physical space and dream equipment’ fantasy? NEW INITIATIVES IN DIGITAL AUDIO PLAYBACK AND AUTOMATION FOR RADIO: MODERATOR - Paul McLane, Radio World, editor in chief; Panel: Don Backus, Enco; Jim Hammond, Wide Orbit; Hari Samrat, Broadcast Electronics: As the line blurs between traditional radio and internet streaming, automation providers are exploring new technologies. From enhanced and simplified user interfaces to automatic, single workstation, multiple stream control options, many initiatives are focused on the operator. Others, like running automation on virtualized hardware and increased utilization of cloud computing center on the engineering side. Learn how leading providers are addressing these and other issues to assist broadcasters in serving a rapidly changing market. MEDIA FILES MANAGEMENT; STORAGE, BACKUP & RETRIEVAL OF YOUR ASSETS: Moderator - David Prentice, Dale Pro Audio: How much, where, and how many? Those were the traditional questions regarding backup for digital media. Backup was always an inconvenient chore and an inevitable by-product of creation but the answers used to be easier. Current options represent an informed bet on the future. On-line, near-line, and off-line storage with spinning disks once seemed expensive but now appear reasonable but will the interfaces and formats be supported in your anticipated time frame? Attendees will acquire an understanding of the multiple solutions available for protecting their digital assets. SOCIETY OF BROADCAST ENGINEERS CERTIFICATION EXAMS: The AES will once-again host a Society of Broadcast Engineers Certification Exam session on site at NY’s Javits Center. Time and location, and walk-up registration details TBA.